At the beginning of the year there was news that Salford University had developed ‘Carebot’ P37 S65. This came just five months after the reports from Japan about the Toyota Robot HSR. It seems care for the elderly or infirm is on the up in the technical world. What is the driving force behind these developments? Is it the cost of care generally or just our fascination with robots? This year the government announced in the budget that funding input from senior citizens would be capped at £72K. This might go towards home-based care or residential care. From 2016 the government would step in and pay the full costs once the cap was reached. Although Age UK has been reading the small print and it seems this isn’t quite the case. Even if you don’t need ‘care’ in these accepted ways, there is no doubt that getting older is often more expensive. Needing more aids to keep us active and mobile does take its toll. Up until now there has been some funding available. How will the new laws affect this? Maybe this is where the robots come in. Though we aren’t expecting them to be cheap! But Carebot does deserve a proper introduction. ‘He’ has been developed by scientist Antonio Espingardeiro, who comments that ‘it could help care home staff and improve residents’ quality of life’. Carebot can carry meals to residents, remind them when they need to take their medication, and can be programmed with speech therapy and object recognition exercises. These two latter possibilities are particularly useful for patients suffering with dementia. It can also keep family and staff in contact with the patient via a video link. Carebot is about the height of an average person and even looks a bit like a human in that robot sort of way. Watch Carebot in action here. This got us wondering why we build robots to look like humans. Is it because we like to think of them as something we can interact with – so they must be ‘human’ to achieve this? Although Shirley Valentine, in the film and play of the same name, found ‘wall’ and ‘rock’ suitable companions when no one else was around! NASA, the American space agency says that this fascination is much broader than what we’ve seen in films and comic books. Engineers and scientists around the world are developing physical characteristics for robots with ‘human-like faces and artificial muscles’. Artificial intelligence is the route ahead by programming robots to use this to replicate human thinking processes. One of the reasons given for making robots look like people, is that we know what to expect from them. This is the view of Rodney Brooks, Panasonic’s Professor of Robotics. Talking about inventing HAL who was to feature in 2001, A Space Odyssey, he explains his reasoning. Creating robots is nothing new. Ancient civilisations all dreamed of creating automated animals or birds. 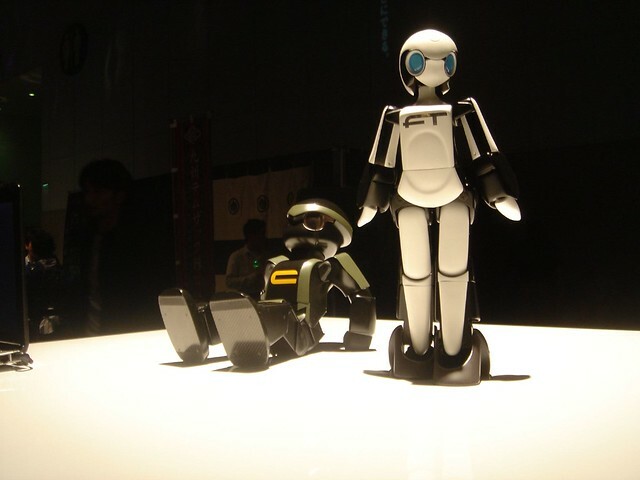 Leonardo da Vinci famously designed a humanoid robot even if only on paper. With so many years of research, there’s still a long way to go before these devices are widely available to help us and make our lives easier, especially as we get older. Never mind the price Mr Osborne!